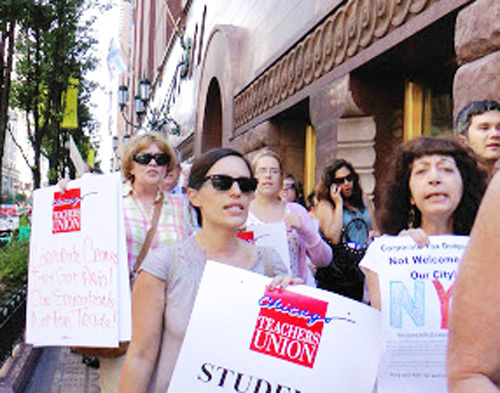 The "Unity" caucus in New York City's United Federation of Teachers (UFT) won the recent union election, returning incumbent Michael Mulgrew to a full term at president of the largest K-12 local in the American Federation of Teachers (AFT) this month. Mulgrew's Unity caucus was opposed in the election by Julie Cavanaugh and the Movement Of Rank and file Educators (MORE). 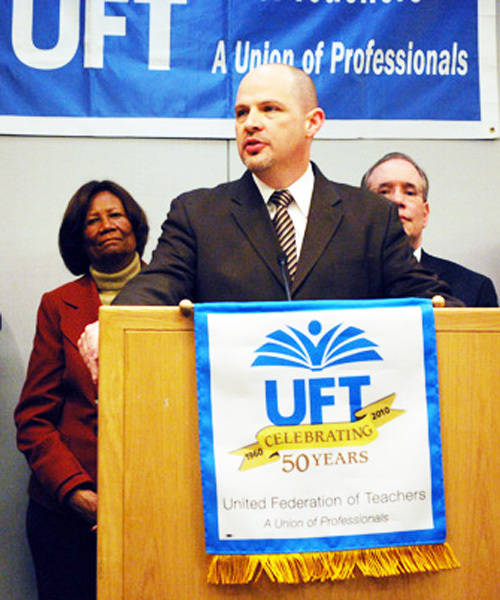 UFT President Michael Mulgrew was re-elected in the New York City union's general election in April 2013.Mulgrew's victory was decisive, but a vote analysis by the MORE caucus, the main opposition caucus currently in the UFT, shows that the power of "Unity" among active duty teachers has declined significantly. The analysis also shows that the use of mail ballots -- instead of voting in schools -- may be keeping the vote totals in New York down (except among retirees). In New York City, retired teacher members of the local can vote in union elections (unlike Chicago, where retirees are excluded from voting in general elections for officers and all executive Board seats but the "Retiree Functional Vice President"). The result is that New York union members joke about the "Sixth Borough" where candidates have to campaign -- Dade and Broward counties in Florida, where a large number of New York retirees now live. In the recent New York election, there were more votes cast by retired teachers than by elementary, middle school and high school teachers combined. The Unity caucus of Michael Mulgrew has won the 2013 UFT elections. The Movement of Rank and File Educators (MORE) congratulates them on their victory, and looks forward to working alongside our union brothers and sisters to defend and improve our union and our schools. MORE members and supporters can be proud of the fact that MORE increased the opposition vote (previously ICE/TJC) in every division. Meanwhile votes for UNITY and New Action declined in every division. Compare this year’s results with those of the last election (see chart at the bottom). Most significantly, MORE ran neck-and-neck with Unity in the High Schools -- with an elementary school teacher as our presidential candidate! We got 40% of the vote there, while Unity got 45%. We still have a long way to go, but MORE’s growth is the result of all the hard work of our members and supporters who carried petitions, distributed leaflets, and promoted MORE’s message far and wide . Julie Cavanaugh at a Chicago protest at CPS headquarters. MORE photo by Norm Scott.75% OF UFT MEMBERS DID NOT PARTICIPATE -- WHY? The majority of UFT members did not bother to participate in these elections. Out of 173,407 ballots mailed, only 43,138 were returned. When 75% of the membership doesn’t think voting is worth their time, that’s a serious problem. We can’t read the minds of those roughly 130,000 non-voting members, but we can imagine that frustration, demoralization, and basic alienation from the union at the chapter level must be ingredients in the explanation. While public education is facing a historic crisis, our union has thus far failed to involve the majority of members in a struggle to defend our rights and to improve our schools. MORE will continue to organize fights against cookie-cutter evaluation rubrics (such as Danielson), against the plan to tie teacher evaluation to high stakes standardized test scores, and in defense of basic protections such as tenure. In this election, most UFT members did not vote for any group. But everywhere we go, we find educators and other school-based workers are responding to MORE’s basic message: We can and will stand up to fight back! Note: The New Action caucus endorsed Michael Mulgrew as it's presidential candidate and some candidates ran on both Unity and New Action slates. MORE is the only independent caucus that ran a slate without any cross-endorsements. The changes in the city schools in the last 7 years have been extremely hard on teachers. Many principals believe the only cost effective teacher is a first or second year teacher. This is because their salaries are very low. This suggests that the person teaching the students should have as little teaching experience as possible. Senior teachers need an aggressive, vocal leader as union president to deal with oppressive policies such as this. Mulgrew has demonstrated his skill as a leader when addressing the crowds and unifying members of the UFT. Teachers with years of experience need more respect than the Bloomberg administration has given.